i made an update because many people ask me to change the decals (not like in real life) and the traction because that was to slippery in corners, i think this is better! i change some other little things like tyres and stuff so enjoy! 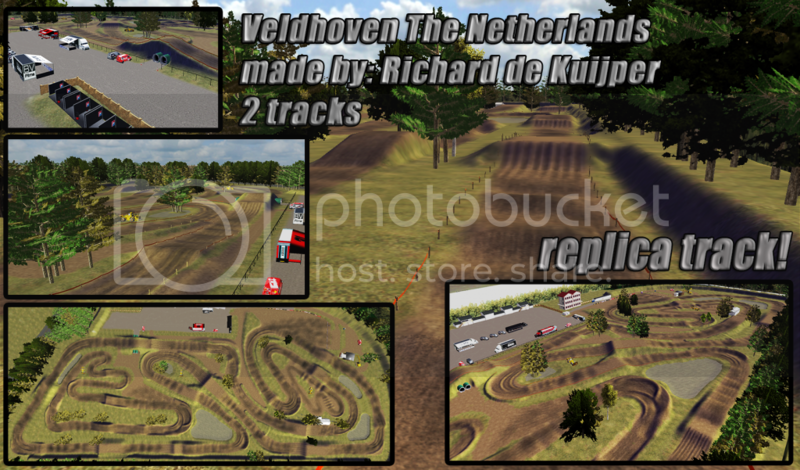 RicharddeKuijper wrote: This is my new track Veldhoven from The Netherlands.It is a sand track whit some nice and realistic tables and other jumps! Cant seem to find the track in-game. Whats the name of the track inside of MX Sim? PureSurreal wrote: Cant seem to find the track in-game. Whats the name of the track inside of MX Sim? I get black ground textures. I downloaded the first link then overwrote with the second ling and still have it. Any idea? Looks awesome from the pics! uhm maybe you delete some files in in like lightning? RicharddeKuijper wrote: uhm maybe you delete some files in in like lightning? Black textures has nothing to do with lighting. I think Stavos758 misses a track that he needs to see the textures. you only need this link to see evrything on the track, i cant help you! sorry!! !